For every folder template, you can add, rename, and delete folders, and change folder permissions. 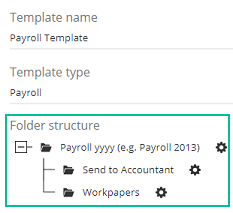 You use folder templates to create the folder structures in your account and set up folder rules for actions such as adding a client, creating a new engagement, or adding an employee. Note: Although folder templates apply to both Tax and Accounting plans, some non-tax templates may be empty for tax customers. 2. Click the Manage Folder Templates icon. 3. Click the View and edit templates icon for the template you'd like to edit. 4. Edit the template as necessary. Note: When you edit the template, it displays all of the folders that SmartVault uses when you create this particular type of Engagement. 1. 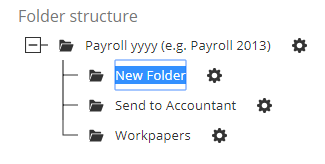 To add a folder, click the gear icon next to the folder and select New folder. This creates a new folder underneath the original folder labeled New Folder. 2. Click this name to edit it. 3. Click the Save changes icon. 1. To change a folder's permissions, click the gear icon next to the folder and select Edit folder. 2. Set the groups who can access this folder and the level of access each group should receive. 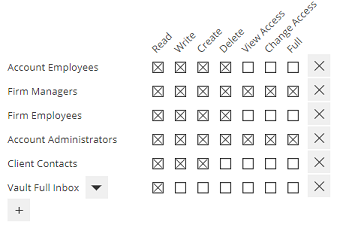 Click the + icon to add a group, and enable checkboxes to set what the group can access. 4. Click the Save changes icon. 5. Click the Save changes icon on the template page. 6. Enter a description for the change you made and click OK.
1. To delete a folder, click the gear icon next to the folder and select Remove folder.